Submitted by asikora on 28 January, 2019 - 16:02. 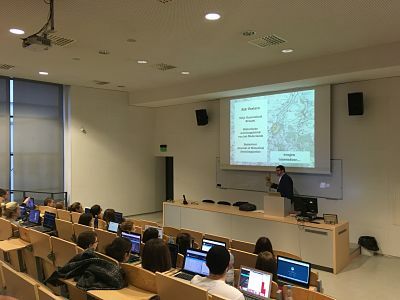 The Department of Dutch and South African Studies was delighted to welcome Prof. dr. Rik Vosters to AMU Poznań, where he gave three classes to our students. On Thursday 17 January, Prof. Vosters gave two classes. The first of these was to second-year Master’s students. He provided them with advice on their dissertations, in particular on aspects of language and culture in Belgium related to their topics. The second class was for third-year Bachelor’s students. Prof. Vosters is an expert on historical sociolinguistics and is leading a research project involving the transcription of thousands of letters written in Dutch. He gave the students an introduction to Dutch in the eighteenth and nineteenth centuries before helping them to begin transcribing letters as part of this project. On Friday 18, Prof. Vosters gave a very entertaining and insightful illustrated talk to the student group, Oranjes, on the so-called ‘language struggle (taalstrijd)’ in Belgium between Dutch and French. A presentation on behalf of the department was made at the end of Prof. Vosters’ talk by Dr. Joby. Many thanks to Prof. Vosters for his excellent contribution to the life of the department and to all the students and colleagues who participated in these events.